The Muscle Car Era is generally thought to have started with the introduction of the 1964 GTO. This midsize car was stuffed with a large high performance engine that turned a sedate family grocery getter into a rip snorting fire breather that could shred the tires down to the core or blast through the quarter mile in record time. By 1969 the Muscle Car was in its’ 5th year and was alive and well. Every major automobile manufacturer was on board as the horsepower wars continued to heat up. Chrysler had its’ 426 Hemis, Ford the 428 Cobrajet and GM a variety of high compression, high horsepower engines from the mighty L72 427 to the awesome ZL1. The 1969 Chevelle SS was now in its’ 5th year of production having started life in 1964. A perennial sales leader the model saw a completely new design arrive for 1968. Little changed in 1969 except now the SS was no longer a standalone model but an option package that could be had on all Chevelle 2-door offerings including the El Camino. 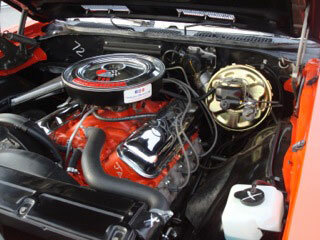 Engine choices stood officially in sales literature at 7 ranging from the 140 HP 230 cu.in. six to the 350 HP large block 396. Two other engine choices were not advertised but available for those who knew how to ask. One was the L78 375HP solid lifter big block that found its way into a select few cars and the other was the very rare L72 427 solid lifter big block with 425 HP. This 427 could only be ordered through the C.O.P.O. program and it is estimated that only 323 people became lucky owners. Transmission choices followed a similar pattern as the engines with plenty to choose from. The standard transmission was a 3 speed manual. Optional automatic choices were 2 speed Powerglide, a 3 speed called the Turbo Hydra-Matic 350 and for the big engines a heavy duty 3 speed called Turbo Hydra-Matic 400 was the choice. Three different 4 speeds were offered called the M-20 wide ratio, the M-21 close ratio and the heavy duty M-22 close ratio ”Rock Crusher”. Rear end gears went from 2.56 all the way up to the high revving 4.88. A ten bolt inspection cover was used for the low torque engines and the 12 bolt indicated a very strong rear axle housing capable of withstanding the massive torque and horsepower of the high performance engines. 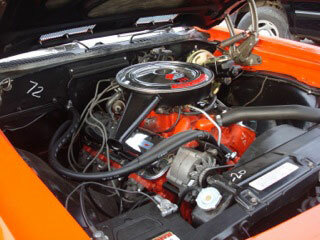 There were 522,761 Chevelles produced in their various configurations for the 1969 model year. Of this number 86,307 had the Z25 SS option. Due to the large number of cars made they were produced in 5 different assembly plants in the US and one in Canada at St. Therese Quebec. The option list seemed to be endless and you could have your car pretty well anyway you liked it as long as you were prepared to pay the price. 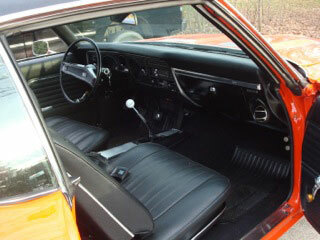 There were well over 300 different configurations you could order for your Chevelle! Talk about choice, there were fifteen exterior colours available to choose from. They were Tuxedo Black, Dover White, Cortez Silver, Garnet Red, Olympic Gold, Butternut Yellow, Champagne, Burnished Brown, Frost Green, Azure Turquoise, Glacier Blue, Dusk Blue, LeMans Blue, Burgundy and Fathom Green. Two additional colours unique to the SS only were Monaco or Hugger Orange and Daytona Yellow. Both were coded separately on the trim tag as either 72 or 76 respectively. The SS came standard with a host of high performance features and options. Included in this package was the L35 base engine 396 cu.in. 325HP, power front disc brakes, twin domed hood, special suspension, a 3 speed manual transmission, black accented grille, black rear cove insert, special 5 spoke SS rims with trim rings and wide oval tires. Production started In September 1968 and finished up in August 1969 giving it a full year of production. It was one of the best years for the Chevelle and a modest facelift would be coming for 1970 along with the monster LS6- 450HP 454 cu.in. V-8. Some say 1970 was the pinnacle of the Muscle Car Era but given the engine and option choices for the 1969 model, this year would have to rank up there as a very close second! So What Is It Like to Drive a 1969 Chevelle SS big block? The lines of the 1969 Chevelle in any form from the plain Jane 300 to the fully decked out SS convertible looked beautiful from any angle. The designers got just the right amount of curves, chrome and symmetry to make this one of the best looking muscle cars of all time. From the muscular look of the SS styled wheels to the subtle twin bulges on the long hood this car meant business in a forceful manner. Our feature car is painted in the special order Monaco Orange with the optional L34 396 engine developing 350HP at 5200rpm and a massive 415 ft./lbs. of torque. In addition to the standard SS features, options included bucket seats, center console with gauges, M-21 close ratio 4 speed, convenience lighting group, AM radio, vinyl roof, F 40 suspension and a 3.55 rear axle ratio. It was built in June of 1969 at the Kansas City Missouri assembly plant. It has undergone a complete frame off restoration and driven little since completion remaining in near showroom condition. Riding on a 112 inch wheelbase with 14×7 inch rally rims, the coupe weighed in at approximately 3330lbs. With plenty of room in front and back for 5 full sized adults, long trips would be comfortable and accommodating for all. 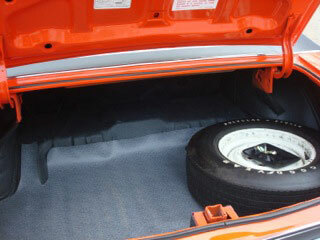 The trunk was a quite useable with a full sized spare and 13.5 cu. ft. of luggage space. With a turn of the key the engine fires up easily and the exhaust note out back makes this one of the nicest sounding cars of all time. The low throaty rumble can be felt and heard throughout the car. The shifter slips easily into gear and the clutch takes up nicely as the huge torque of this hydraulic lifter engine moves you on your way with authority. The seats are firm and very supportive (for the time of course) and the shifter and steering wheel are well positioned and feel just right. Downshifting or upshifting is done with ease and the shifter moves through the gears fluidly and with precision. The doors swing out wide to give you easy access to the sculpted bucket seats that are both comfortable and inviting. Inside is very pleasing to the eye with all of the critical controls at your fingertips and in just the right location. 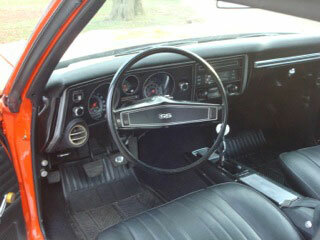 The gauges are easy to read and the all-important tachometer is right at the perfect eye level. The 4 speed shifter fits snugly into your hand and the plastic standard steering wheel feels a little thin but does give easy viewing to the gauges beyond. 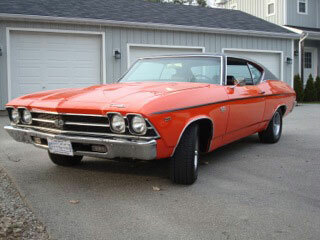 Compared to our 1969 Z28 that we also feature on this site, the Chevelle handles the road with firmness and authority. The steering is responsive and feels nice and tight. The suspension gives a firm yet comfortable ride and cornering comes with a degree of confidence not seen in many cars of the day. Braking is an easy task as the front disc brakes slow you down quickly and confidently. Acceleration from a standing start must be done gently as this is not a positraction car and wheel spin can be quite severe if too much power is applied. With 3.55 gearing the power of the engine takes a little time to get into its’ sweet spot that comes above 4,000 rpm but once there pulls very strongly right up to its’ 5500RPM redline. The beautiful sounding exhaust is music to your ears and those around you as you speed shift through all 4 gears. Performance wise the L35 base engine could run through the quarter mile is approximately 15.4 seconds at about 94 MPH. Not blistering by any means but still respectable. You really needed to up the ante to get some serious performance going. The L34 which puts out 350 HP and a little more torque than the L35 would reduce your quarter mile time by about a half a second. The top dog L72 427 would get you there in low 13 second passes, truly amazing for the time. The 1969 Chevelle had it all. Reasonably priced, great performance, an option list that could let you customize to your own tastes and looks that were as good as it got in the muscle car era. It was one of the best and is still recognized as such by car enthusiasts of all ages. Thumbs up all around! This 1969 Chevelle SS 396 Coupe is one of our Museum cars available for sponsors or patrons for promotional purposes. Please contact us to find out how you can have it at your Dealership, Automobile Show or Special Event.